As an oncologist, I detest running late, because it means leaving people with cancer on their minds, stewing in my waiting room. Personally, I worry when I am waiting at the dentist for a cleaning. What goes on in the mind of someone waiting to see me? After the crash she sat in her car, writing out her phone number for me, saying, “I was late for work.” I remember looking at her with absolute disbelief, thinking You almost killed me because you were late for work? That line keeps coming back to me at the oddest times. I’ll see someone blow through a red light and hear that lady saying, I was late for work. And then I think, I hope they don’t kill someone just because they couldn’t bother to leave on time for work today. What causes us to run late? Some people fall prey to underestimating the time it will take to get somewhere. That’s not my personal weakness. I’m what Penelope Trunk calls a “time pessimist”; I assume things are going to take longer than my first estimate. I’ve learned that Google Maps gives me an optimistic driving time. And I live in an area with minimal public transit and winding two-lane roads, where any traffic snarls lead to major delays — so I’ve learned to pad many minutes into my driving times. Some people are hooked on the adrenaline rush of cutting things close. In her book It’s Hard to Make a Difference When You Can’t Find Your Keys, Marilyn Paul notes that “there is a thrill in running late, postponing something to the last minute, or meeting a deadline by minutes. If you’re in your car, rushing to an appointment, you experience the exhilaration of trying to get through each traffic light.” She goes on to explain that there are better ways to get your adrenaline rush. But I don’t get a thrill from cutting things close — quite the opposite. I’m one of those people who is nervous enough about missing a plane that I arrive at airports ridiculously early. I’m also not someone who tends to get held up because I’ve misplaced something. My house keys go on a hook by the front door. My Prius car keys and my wallet stay in my purse. I’ve got a tote bag that has everything I need for a certain weekly meeting. Sure, I will sometimes misplace something and have to scramble, but it’s a rare event. Rather, when I’ve found myself leaving home later than I intended, it’s usually due to what Kathleen Nadeau calls one-more-thing-itis. I send one more email. I do one more seemingly tiny task. Then I hope there’s no traffic jam, because I’ve eaten up all my carefully planned buffer time. And I promise myself I’m never doing this to myself again. But for many people, it’s difficult to develop the habits needed to arrive on time. For anyone who is chronically late and concerned about that, but is finding it hard to change, I’d recommend Never Be Late Again, by Diana DeLonzer, which presents “seven cures for the punctually challenged.” It’s a book filled with both humor and wisdom, from an author who has overcome this challenge herself. Additional help: Hang something as simple as a removable utility hook near your front door or inside your coat closet to hold your keys every time you come into your home. Set alarms on your smart phone, watch, or Time Timer to remind you to get out the door when you need to. Time yourself doing regular morning activities (brushing your teeth, taking a shower, walking your dog around the neighborhood, getting dressed, eating breakfast, etc.) to see how long it really takes you to do these activities. As humans, we often underestimate how long things take us to do, and having a real sense of the time it takes you to get ready can help you plan your day better so you can get places on time. If you have gadgets in your home or office, chances are that you have (at one point or another) encountered a tangle of cables and wires that were difficult to decipher. Sure, you can go wireless to avoid the problem altogether, but for those of you with wired devices, there are several products you can use to corral your cords. 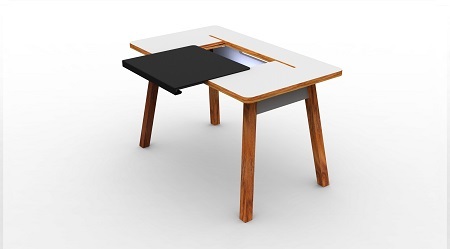 You can also use a desk that has special features to help you keep your cables from cluttering your space, like the Cable Guy Desk created by Ingland Designs (the same designer who made the Mealbox, dining table and chairs in a box). At first glance, it’s not very obvious how this desk keeps your cables in order. 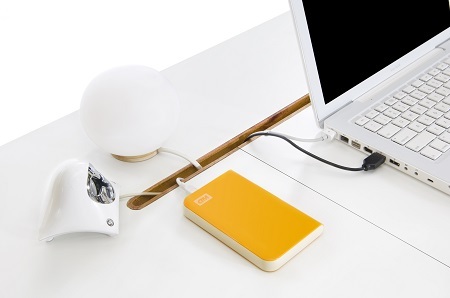 Give it a closer look and you’ll notice the track for storing your cords inside the legs of the desk. 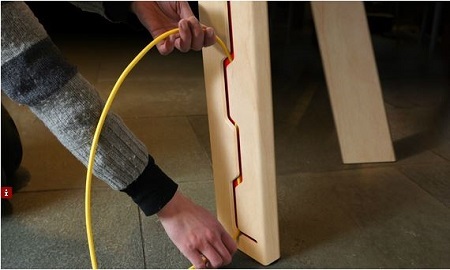 There’s also human-shaped grommet on the surface of the table for your cables to drop through. You can get the desk in large sizes to accommodate several people. This can work well in a meeting room or if you need to share a desk with another person. You can also get the optional ball speakers (with accompanying grommets). The StudioDesk by Bluelounge (you might be familiar with another of their products, the Cable Drop) has a slot on one end for your cords to flow through as well as a hidden storage area that’s large enough to house power strips, USB hubs, external hard drives, and a MacMini server. The StudioDesk comes in two sizes (standard and extra large) and doesn’t appear to have drawers or any other bells and whistles. It is, however, very easy to assemble. Simply add the legs once you receive it. 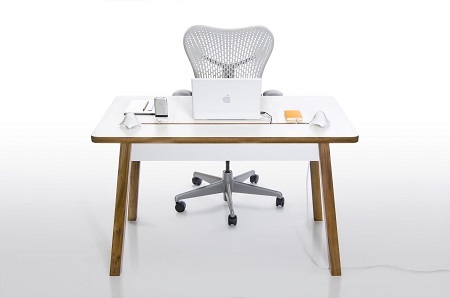 OneLessDesk, though it has a small footprint, this desk has two parts — an upper and lower deck — the latter of which can be used for your keyboard, laptop, or as a flat surface for writing. The upper deck can be used for storing your primary (or secondary) monitor or keeping the items you need to access on a regular basis. It also has a rear-facing shelf for your peripherals or power strip. Adding labels or tags will help you figure out items match each cable. Though each desk has its own unique way handling cables, they all have a simple design that is intended to help you keep cords and wires from cluttering your desk. If I’m to believe fancy music videos, people who party on yachts and tropical beaches can afford wine buckets and coolers to keep bottles chilly. I really like the way this arrangement of furniture incorporates the top of the filing cabinet and the entirety of the bookshelf into the workspace of the desk. I can imagine My_OCD takes advantage of these additional surfaces when in the heart of a work project. Having a place for a drink that is off to the side but still easy to grab is nice, too, and likely keeps spills to a minimum. The layout of the equipment is well done, and I like how the subwoofer is in one of the bookshelf cubbies instead of on the floor under the desk. It could be easy to get some cable clips and put them on the back of the shelves to run cables through, but if the cables aren’t bothering My_OCD it’s certainly not a big deal. Thank you, My_OCD, for sharing your workspace with us. We are excited to announce a new Unclutterer partnership today. We have joined forces with Quarterly to help people find order in their homes and offices. What’s Quarterly? It’s a subscription service that sends out curated packages four times a year, as its name implies. The Unclutterer staff will be selecting the items that go into all of the Unclutterer mailings. We will be including straightforward directions on how to use/install/manipulate the items. These will be quality products that will bring a higher level of organization to your spaces. Each mailing will be focused on a particular theme, to help you find order in a specific area of your life. It may seem counterintuitive for a site called Unclutterer to be pairing with a product site like Quarterly, but it’s not. Rest assured, the products we have chosen for our mailings are useful and clutter-curing, not clutter-creating. Our assumption is that for every item we send, you will actually be able to subtract one or more things from your homes and offices. Or, the items will help you discover a significantly improved level of organization in your life. We will not be sending clutter. 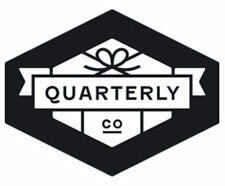 The people at Quarterly are Unclutterer readers who support our mission and reached out to us to work with them. They understand our point of view. If you’re interested, you can learn more about Quarterly and Unclutterer’s partnership on Quarterly’s site. We truly appreciate anyone who chooses to subscribe to our mailings, as in addition to helping you become more organized, a small percentage of the subscription fee comes to us so we can keep the lights on, servers running, and our writing and technical staff paid for all of their hard work. Subscribers need to sign up for the first mailing by June 1 and the first package will go out on June 14. Update for clarification: Our many years of experience as professional organizers has taught us that there are universal clutter problems for which almost everyone needs better solutions and tools. The themes of our mailings will address these universal issues. Additionally, if you already have the solution we mail, the items will make wonderful uncluttered gifts for friends and family so you can spread your vision of an uncluttered life with others. We are very confident, however, that people who choose to participate will be more uncluttered after receiving our mailings. You’ve uncluttered your home, and now you’re making sure everything you’re saving has its defined storage place. You’ll usually want to store the things you use most often in easy-to-reach places — but please make sure you’re also storing things safely. Here are some of the issues you’ll want to consider. A recent study by Safe Kids found that parents know the importance of storing medications up and away from children — but emergency department visits for accidental poisonings are still increasing. What’s going on? Children are ingesting medicines found on the floor, in purses, in pillboxes, etc. They get into these medicines not just at their own homes, but also at the homes of grandparents or other relatives. So when you’re looking at storage requirements, be sure to think about those pillboxes and purses. And, remember that pets can also get into medications. 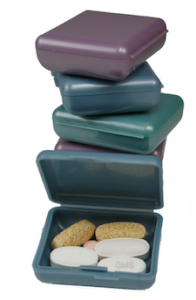 For more information, check out the Up and Away website, which reminds us to put every medicine and vitamin container away every time you use it — even if you’re going to use it again in just a few hours. Most everyone knows to keep things like pesticides and antifreeze in places where children and pets can’t get to them. But other hazardous products might escape attention. For example, the Consumer Product Safety Commission has issued a safety alert warning about the dangers of single-load liquid laundry packets. These colorful packets look like toys to children, but they often contain chemicals that are dangerous if ingested — so they need to be kept safely away from kids. If you have pets, please be aware of the materials that may be toxic to them, and store those items appropriately. The Pet Poison Hotline has a detailed list of pet toxins for cats and dogs, including items like chocolate, matches, nicotine, and mothballs. Since so many foods can be poisonous to pets, you’ll want to be sure you have a pet-proof garbage can, one that’s tucked away where pets can’t get into it, or pets that are trained to never raid the garbage can. Living in earthquake territory, I’ve learned about the perils of toppling bookcases and other heavy items. The Dare to Prepare website reminds readers to tightly secure everything that could injure someone if it falls — as well as any fragile items you would hate to see damaged. The site provides information on how to properly secure bookcases, filing cabinets, etc. But, until recently, I hadn’t thought about how easily children can get crushed if a television or a piece of heavy furniture were to fall on them — which can happen when a child reaches for something like a remote or climbs onto the furniture to get to an attractive item. The Georgia Department of Public Health has written about these issues, and the Consumer Product Safety Commission has a Tip-Over Information Center. Safe Kids has a report providing extensive information about the TV tip-over problem and how to avoid it. Where do you store plastic bags? Do you dispose of dry cleaning bags immediately, in places where young children and pets can’t get hold of them? These bags can present a suffocation risk, so please handle them appropriately. The Canadian Paediatric Society recommends that you “tie plastic bags in a knot before storing them out of reach and out of sight” if you have children ages 6-12 months. Being well organized also gives you the opportunity to be more safe in your home. Storing items securely and safely can help to prevent accidents. Each parent has a different style when it comes to discipline. This isn’t a post about the merits of those styles, but rather a mocking of an item that I believe is supposed to be used with the 1-2-3 Magic time-out method. In short, the discipline system boils down to a parent counting to three, and then a child earning a time out if she fails to comply with a request. First, why in the world would someone need a specialized chair just for time outs? What is wrong with a kid’s room like the method suggests? Or all the other chairs in a person’s house? Or a spot on the floor? Or the stairs? Second, and this seems to be a thing with me lately, why does a kid need a gender specific time-out chair? Can’t a kid just have a plain chair that isn’t painted with stereotypical gender items? If you have multiple kids of different genders, are you expected to buy two chairs? Or do girls just never need time outs? Third, with “time out” emblazoned on it and a child mentally associating it with punishments, a kid isn’t going to use this chair for anything else, ever. I don’t have any evidence to support this claim, but my guess is that a kid will develop a fear of chairs of similar shape and size as this one and quite possibly need counseling for the phobia later in life. 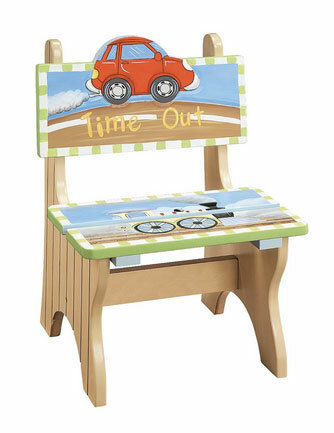 Finally, as far as time-out chairs go (and, there are surprisingly a lot of them on the market) this Boys Time-Out Chair is the bottom of the barrel in comparison to a sand filled hourglass time-out stool you can build yourself. At least that stool serves the function of being a really cool game timer once your kid outgrows time outs as a punishment. From time-out stool to world’s largest egg timer! Weird, but at least a multitasker. Thanks to reader Samantha for sharing this unitasker with us. This week is the first National Severe Weather Preparedness Week in the US. The National Oceanic and Atmospheric Administration, along with a number of other acronym-identified organizations, started the week to help Americans prepare for floods, tornadoes, hurricanes, major thunderstorms, earthquakes, volcanoes, wildfires, and whatever else nature throws our way. Have any of you seen a pet umbrella in action? It is definitely something to see. “Write down the thoughts of the moment. Those that come unsought for are commonly the most valuable.” — Francis Bacon, Sr.
It’s no secret that writing things down is beneficial in several ways. A mind that’s not trying to remember tasks is better prepared for problem solving and focusing on the present. Good ideas are fleeting and need to be captured, irrespective of when they happen. It’s important to have written goals and lists that can remind you of what you need to do. There’s more, of course, but I’m going to address that last point. I’ve been keeping a to-do list in my pocket for years. For most of that time, it was a simple list of things I needed to do. That’s great, but I found problems. Notably, I’d feel guilty about tasks I couldn’t complete because of my circumstance. For example, I can’t make progress on “get pants hemmed at the tailor” while I’m stuck at my desk. I can’t pay the registration fee for the kids for soccer while I’m standing in line at the DMV. Likewise, I often don’t have the energy or time available for more demanding tasks when I’m reviewing my list at the end of the day. Of course, context isn’t the only way to decide what you can work on at any give time. It’s smart to also consider your time available and energy available. When your fresh first thing in the morning, tackle those jobs that require much physical and/or mental energy. Reserve something less taxing, like filing receipts, for the end of the day or after lunch when you might have a dip in focus. Likewise, I don’t always have the time to lay out the new flower bed. But a free Saturday afternoon lets me do just that. A few weeks ago, I came across Word Notebooks. My notebook addiction is legendary, so I could not resist buying a pair. They’re similar in size and shape to the Field Notes brand notebooks that I love so much, but offer something different. Each paperback notebook has a “use guide” that’s printed on the inside cover and in the margin of every page. You’ll find a small circle around an even smaller circle. The idea is to highlight the importance and completion state of each item with these circles. Here’s how it works. It’s tidy and offers an at-a-glance overview of the status of your to-do list. Unlike the context system that I use or the energy-available strategy, the Word notebooks visually arrange action items by priority and state of completion. Pretty nice! Of course, you don’t have to buy a special notebook with pre-printed circles. You could roll your own solution. My Internet buddy, author and all-around nice guy Patrick Rhone described a system that he devised for keeping careful track of the items on his to-do list. His system uses plusses, arrows, and geometric shapes to denote the status of an action item. It’s clear, simple, and doesn’t require a special notebook. Now I’ll turn it over to you. Do you keep a plain list or have you adopted a system like these? Let me know in the comments. For this week’s unitasker selection, I wanted to keep with the April theme of coffee-inspired unitaskers. And, when looking for such unitaskers, my kitchen seemed like the perfect spot to find candidates. The first goal is to put a sorting system in place so the mail has a place to go immediately upon entering the house. As far as I can tell, this may be the perfect unitasker. The NuForce DAC gives you affordable high-end computer audio in a compact and simple package. A few weeks ago, we released the new Unclutterer Forum. Although the system is powerful and has a lot of new cool features, it isn’t doing everything we would like. We at Unclutterer know what we would like to change — but what about the rest of you? Dear Erin, Wow! You took the words right out of my mouth! What a great question. Disable being able to post as “guest.” Or, rather, to leave a comment you should have to create and be logged into an account. Expand the Challenges section to show a list of the different challenges directly on the Home page of the Forum. Then, when click on the specific challenge, it will take the user to a month-by-month listing of the discussions of each challenge. Fix the New Topics listing so that it operates similar to the old Forum. Have the discussion topic appear instead of individual posts. Also, have all new discussions listed, not just those new since the last time the user logged in. Have the Active Topics and the New Topics be the same, so users have two ways to find the most recent discussion activity. Reinstate the RSS that allows users to subscribe by email to new topics that have been started, not just specific discussion threads. Add moderators, which we have already done. There are now four moderators for the Unclutterer Forum. Forum users and those who are interested in joining the Forum community, what do you think about the list above? Is it accurate? Does anything need to be changed before we send it off to our techs? Does anything need to be added? Please share your thoughts with us. We really do want to make the Unclutterer Forum a fun and exiting place for everyone to gather and discuss their adventures in uncluttering. I write things down all day, from capturing ideas to outlining articles and ideas. However, the most important list is the one I make right before bed. Every night, I review what I’ve accomplished and what’s outstanding. Next, I write down the three most important tasks that I must complete the next day. This practice has two main benefits. First, it shuts off my brain. Tell me if this sounds familiar: your body is ready to go to sleep but your brain decides it’s party time! So it starts to review everything that needs to be done. Good times! When I’ve got those things out of my brain and committed to a list that I’ll see in the morning, the plug gets pulled on that party. Second, it lets me avoid the overwhelming feeling of not knowing where to begin. Many of us have 10, 20, or more outstanding projects. It can be hard to know where to start when you have so many. Deciding before I sit down helps alleviate that feeling and provide direction. Conversely, approaching the workday without a list of observable, clearly-defined actions creates one of two scenarios. Either you’ll attend to every distraction that pops into your mind and make insignificant progress on many projects, or you’ll spend an inordinate amount of time on a project that’s less critical than others. Every night between 9:00 p.m. and 10:00 p.m., I review my project lists and pick the three mission-critical tasks that MUST be completed the following day. Then, I gather 5–6 other tasks that can wait a day but would be the icing on the cake if completed within the next 24 hours. I then take a pen and a notebook and write them down. This simple practice reduces my anxiety tremendously, lets me sleep, and gives me direction in the morning. When it’s noon and I’ve completed all three critical tasks, I feel fantastic. There are a huge number of tools available for creating such a list of actions. I use David Seah’s Emergent Task Planner. It lets me create a list, track how much time I actually spend on each (instead of my estimate), and gather incoming “stuff” as it shows up. It’s super useful. Of course, most computers come with a quick note-type app. If you’re happy with just a bullet list, give it a try. The Pomodoro Technique. I use a modified implementation of this method. At its heart, it’s a way to alternate timed work sessions with break sessions. I work for 25 minutes straight and then take a 5-minute break. When the break’s over, I start again with another 25-minute work session. After three rotations, the break extends to 15 minutes, the I go back to 25 on, 5 off. Mac users who want to try it out will love BreakTime. This unobtrusive utility lives in my Menu Bar and times your work/break sessions all on its own. Others should consider Focus Booster, a free, browser-based timer that looks great and works well. Boomerang for Gmail. I usually check email at 9:00 a.m., noon and then 2:00 p.m. I, like so many others, had become a slave to the inbox and I don’t want to do that anymore. I use Gmail for a lot of work-related email, and Boomerang lets me schedule when I interact with it. I can determine when messages will be sent, but even better, select when I want to see certain messages. During my morning sweep, I can use Boomerang to remind me of certain messages while I’m processing email again at noon. Like many of you, I’m still struggling with the best way to manage all of this. These practices and apps have helped quite a bit. If you’re doing something similar (or completely different), let me know. For the past two weeks, I’ve been completing my three mandatory tasks by 3:00. It feels great.